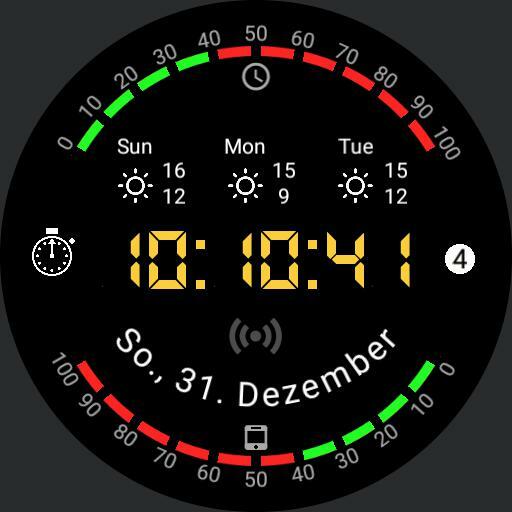 This watchface shows the most important information on the main screen, like time, date, battery levels, weather forecast and WiFi level. However, if you like less you can choose what is displayed. On the center right the number of agenda items are shown if there are agenda items. The watchface has three sub-screens for stopwatch, agenda and apps. The agenda shows all 10 items completely. No truncated text, long item text is shown in multiple lines. The complete text can be scrolled by two buttons. Tap stopwatch symbol on the left to switch to stopwatch. Tap number of agenda items on the right to switch to agenda. Tap at 2 o clock position to switch to app-start screen. Tap above center to change color of text in the middle. Tap below center to change color of other text. Tap at the very top several times to choose what is displayed on the main screen.